AMSTERDAM, The Netherlands, August 11, 2014 (ENS) – The Greenpeace icebreaker Arctic Sunrise sailed back into Dutch territorial waters Saturday after more than 300 days in Russian custody. It had been nearly a year, to the day, since the Arctic Sunrise left the Norwegian port of Kirkenes on a mission to call world attention to the dangers of Arctic oil development. The Dutch-flagged Arctic Sunrise had been held in Russian custody since last September 19, 2013, the day after it was involved in a direct action against the Russian state-owned oil company Gazprom, as it prepared to drill the world’s first oil well in Arctic waters. Russian authorities seized the ship and took 28 activists and two journalists into custody following the protest at the Prirazlomnaya oil rig in the Pechora Sea off Russia’s northern coast. During the action, several of the Greenpeacers tried to board the rig and unfurl a banner condemning oil development in the Arctic. Greenpeace objects to Arctic oil extraction in part because it fears a spill would be impossible to clean up and in part because of the climate risk of burning oil and gas. As flag state for the Arctic Sunrise, The Netherlands asked for immediate release of the ship and shipmates to Dutch authorities. The Dutch government argued that since the ship was outside Russian territorial waters and outside the (500 meter) safety zone around the oil rig, it was in open sea, and hence outside Russian sovereign rights and jurisdiction. On November 22 the International Tribunal for the Law of the Sea ruled that the campaigners and the ship should be immediately released, and should be allowed to leave the country, against a bail of 3.5 million euros to be paid by Greenpeace. A criminal case against the “Arctic 30″ was opened by the Investigative Committee of Russia. They were held in custody in Murmansk for several months on charges of piracy and hooliganism. Shortly after they were transferred to Saint Petersburg on November 12, the Kalininsky and Primorsky district courts released most of the Arctic 30 on bail. Under an amnesty, charges against them all were dropped in December 2013. On Saturday, several members of the Arctic 30 greeted the ship and went aboard in Beverwijk, near Amsterdam. “This is a joyous day for me, for my friends and for the millions of people around the world who campaigned for the release of the Arctic 30 and the Arctic Sunrise,” said Dutch climate and energy campaigner Faiza Oulahsen of The Netherlands. She was imprisoned for two months last year on piracy and then hooliganism charges following the protest. “The companies and governments who seek to exploit this vulnerable region for profit have tried to silence the growing call to protect the Arctic for future generations. But they have not succeeded. And they will not,” declared Oulahsen. Oulahsen went on to thank the many civil society organizations and individuals who spoke on behalf of the activists, including 11 Nobel Peace Prize winners, Archbishop Desmond Tutu and a host of senior political figures from across the world. The activists saw the ship for the first time since it was seized by Russian security agents on September 19, 2013. 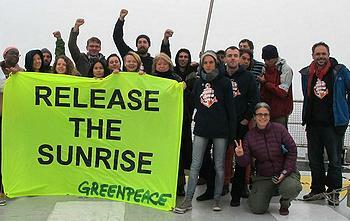 The ship then sailed into the Amsterdam harbor, accompanied by a fleet of Greenpeace supporters in small vessels. In Amsterdam the Arctic Sunrise hosted a homecoming ceremony. On board the ship is a samovar, a traditional Russian tea pot. The samovar, engraved with the words “MY Arctic Sunrise – From Russia with love,” will stay on board, as an ongoing symbol of support and care from the Russian Arctic defenders. As the Arctic Sunrise arrived in Amsterdam, members of the Arctic 30 drank the ceremonial first cups of tea from the samovar. In a few days the ship will be moved to an Amsterday shipyard for repairs. Even though Captain Daniel Rizzotti and his crew have worked for several weeks in Murmansk to make the Arctic Sunrise seaworthy again, much work still needs to be done. Within two weeks Greenpeace expects to have an idea of the extent of the damages. Greenpeace claims that its protest action at the Prirazlomnaya oil rig has caused Russian authorities and Gazprom to start making “slow, but important steps in the right direction.” The Russians are “at least appearing to solve environmental problems in the Arctic that Greenpeace Russia and other nongovernmental organizations have been warning of for years,” the group says. Here are the six most notable changes, wrote Maria Favorskaya on the Greenpeace International website on August 8. 1 – Russia announced in the Arctic Council that it will support a legally binding international agreement against oil pollution of the Arctic Seas, a move Greenpeace has been advocating. 2 – Russia’s President Vladimir Putin tasked the Russian Government and oil companies with preparing measures on protecting the Arctic biodiversity from oil spills in cooperation with scientists and NGOs. 3 – Gazprom made an effort to improve its notoriously weak oil spill contingency plan for the oil rig Prirazlomnaya. 4 – The Russian Ministry of Environment has acknowledged the huge scale of the oil spill problem in Russia and promised to employ new technologies such as satellite monitoring to improve the situation. 5 – The Ministry of Natural Resources, as a result of Greenpeace Russia campaigning, agreed that granting oil giants like Rosneft and ExxonMobil licenses to develop hydrocarbons inside Russian federal nature reserves is not right. Any industrial activity inside protected areas is illegal according to Russian law. Greenpeace is asking the ministry to adjust the licenses to block borders which overlap with the Russian Arctic National Park, Franz-Joseph Land reserve and other fragile areas, by the end of this year. 6 – Greenpeace Russia pointed out that under current Russian regulations an offshore oil rig like Prirazlomnaya can extract oil for two years without training its personnel in oil spill response. The Ministry of Emergency has since drafted amendments that would change this situation.